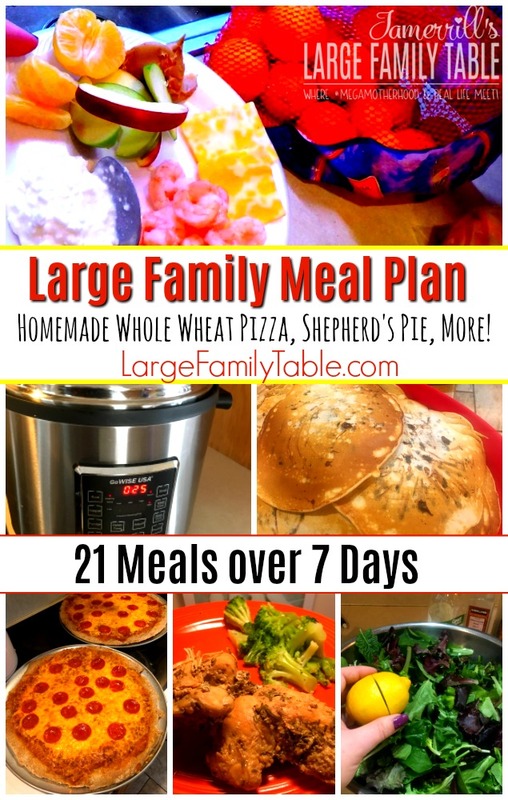 I’ve shared several large family meal plans over the years from this huge 4-week large family meal plan to all of the large family meal plans I shared along with these grocery shopping hauls. Because I’ve had many requests from blog readers and YouTube viewers to share what my large family actually eats in a week, and to see how we use my large family recipes in real life, I’m going to give it a go at sharing a weekly large family meal plan right here on Large Family Table. I’m going to base these large family meal plans off of what I really fed my large family last week. That way you don’t have to wait for any new large family recipes I’m developing (because I’ll make sure to publish those along with these new meal plans) and I can still get fresh recipes created and have time to breath, haha! The main point in me sharing these weekly large family meal plans is to give you a helpful resource in your meal planning process. I have found it takes a lot of momma brain power to meal plan, grocery shop, and feed all these people. Now you know I like to do a few days of large family freezer cooking a month so I can keep our freezer stocked up as much as possible. We end up doing a combo of fresh cooking and freezer meals to change things up a bit. Even though I have meal planned for an entire month countless times over the years, I find myself in recent months still planning 4-6 weeks worth of food but deciding the nitty-gritty or what we’re actually putting in our mouths for about 7-days at a time. I like to write the quick weekly large family meal plan out on a little Monday-Sunday white board on my fridge. This way I can base the food for the coming week around field trips, appointments, schedules, etc. All of my large family freezer meal recipes can also be great “day of” recipes. You can, of course, make the full large family recipe to get ahead and stock up your freezer, too! As I always encourage with anything, make it work for you! I can make my homemade whole wheat pizza dough in the bread machine the day we need it. However, the pizza dough I used on this day was from the freezer. I had to set my dough out the night before for it to be ready by this evening. Yes, two days in a row since we made a bunch of tuna salad the day before. You can also do Baked Oatmeal to change things up a bit. Both the White Chicken Chili and Corn on the Cob can be done in the Instant Pot (or another brand electric pressure cooker). 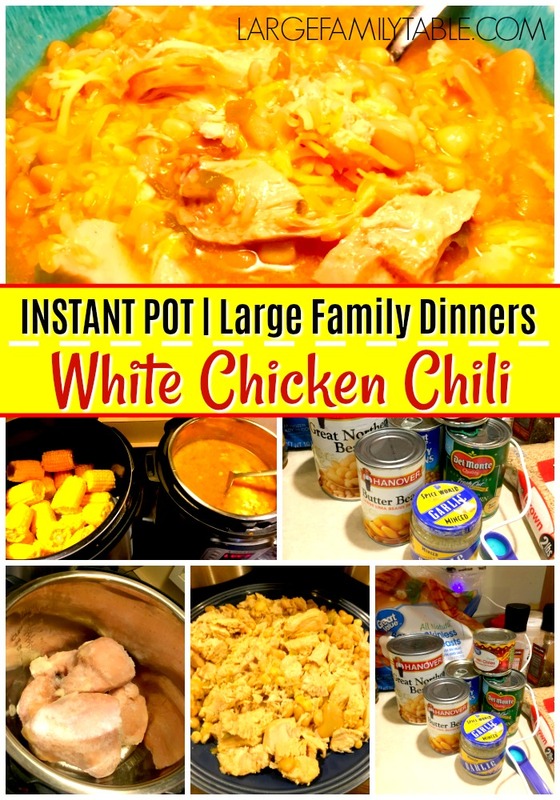 You can also throw all the White Chicken Chili ingredients in the slow cooker. Leftovers could be from previous day’s breakfasts, lunches, or dinners. It’s just the odds and ends still hanging out the fridge. You can see here how we do carrot sticks in bulk for large family snacks. You can use either the Instant Pot or Slow Cooker for the Rosemary Garlic Chicken. When we eat out Sunday after church it’s a big meal around 2 p.m. By the time we get home, we’re all pretty tired and ready to chill out and relax for the rest of the day. This makes it a great evening for everyone to eat up any leftovers from the last few days. If we’re low on leftovers (which happens) everyone will fix themselves something simple to eat for the most part. If it’s a Sunday we’re not eating out I’ll have a big meal in the slow cooker to be ready to eat when we get home. We’ll usually eat that again very casually a few hours later. I hope you enjoyed this week’s large family meal plan! If you like I’ll probably change it up a bit to share weekly, biweekly, and even some more monthly large family meal plans based on what’s going on in my kitchen. All Large Family Recipes ~ Slow Cooker, Instant Pot, Easy Oven Meals, Stop Top Specials, and more! Large Family Meal Planning ~ lots of additional large family meal plans and meal planning helps! Large Family Freezer Cooking Days ~ one day, two days, before baby, postpartum, many large family freezer cooking days shared. 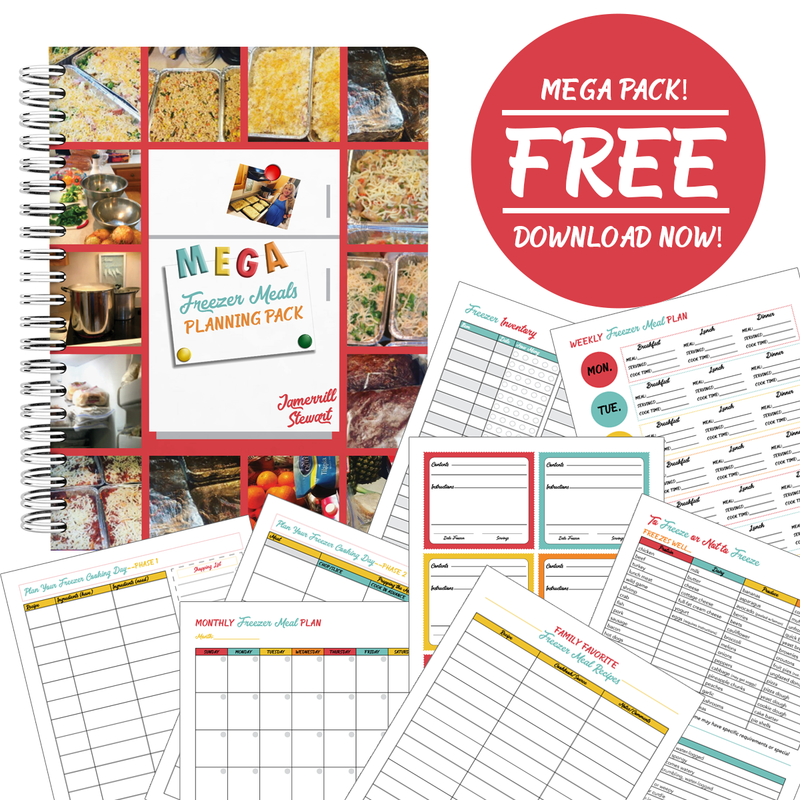 Grab your free copy of the Mega Freezer Meals Planning Pack right here! 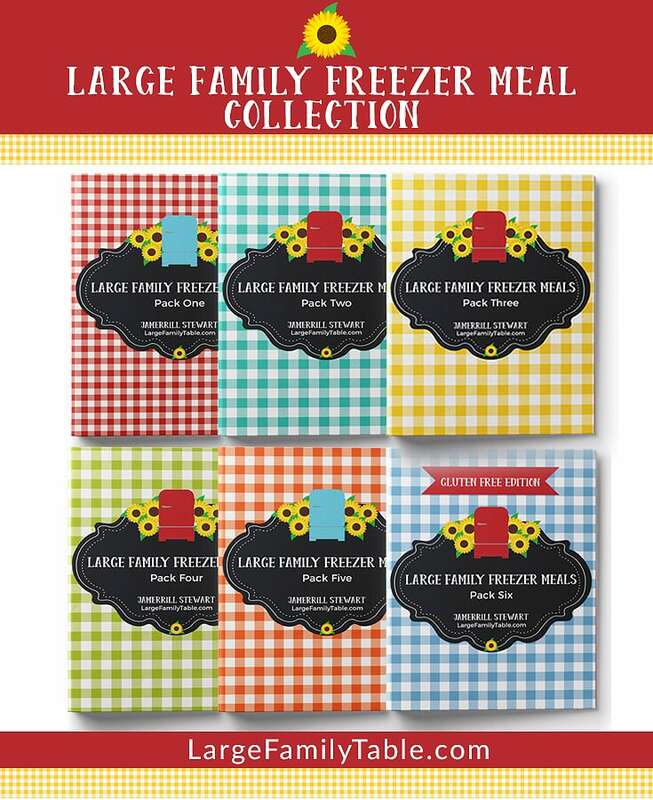 Large Family Freezer Meal Recipes ~ here my best large family recipes that are perfect to make ahead and freeze! Happy large family meal planning and have a super blessed week! !